Title [Eddie Mack, attorney Robert Cantwell, Sr., and State's Attorney Assistant Frank Johnston, Jr. standing in front of judge's bench] [graphic]. Physical description 1 negative : b&w, glass ; 4 x 5 in. 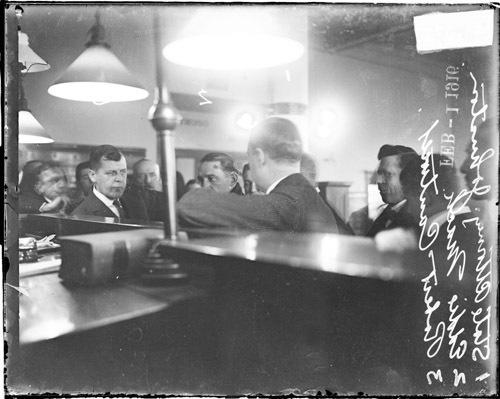 Collection summary Image of Eddie Mack, who confessed to robbing the Washington Park National Bank, standing in front of the judge's bench in a courtroom in Chicago, Illinois, with his attorney, Robert Cantwell, Sr., and Chief Assistant to the Cook County State's Attorney Frank Johnston, Jr.
Washington Park National Bank (Chicago, Ill.) robbery, 1916.